Designed for 16" Ford E350 and E450 steel wheels, 1992-2007, eight lug nut, eight hand hole with the noted wheel numbers. The price is for one complete set of (4) which includes mounting hardware, installation wrench, and shipping within the contiguous 48 USA states. Please be informed that we will no longer process orders for shipment outside of the contiguous 48 US states, sorry. These covers feature our secure, state of the art over the lug attachment that bolts onto your wheel without lug nut removal. This attachment system eliminates the hassle of the now obsolete, under the lug mount, typically referred to as bolt-on, which requires the removal of lug nuts. Our "over the lug" mount system is now used widely on heavy commercial trucks. 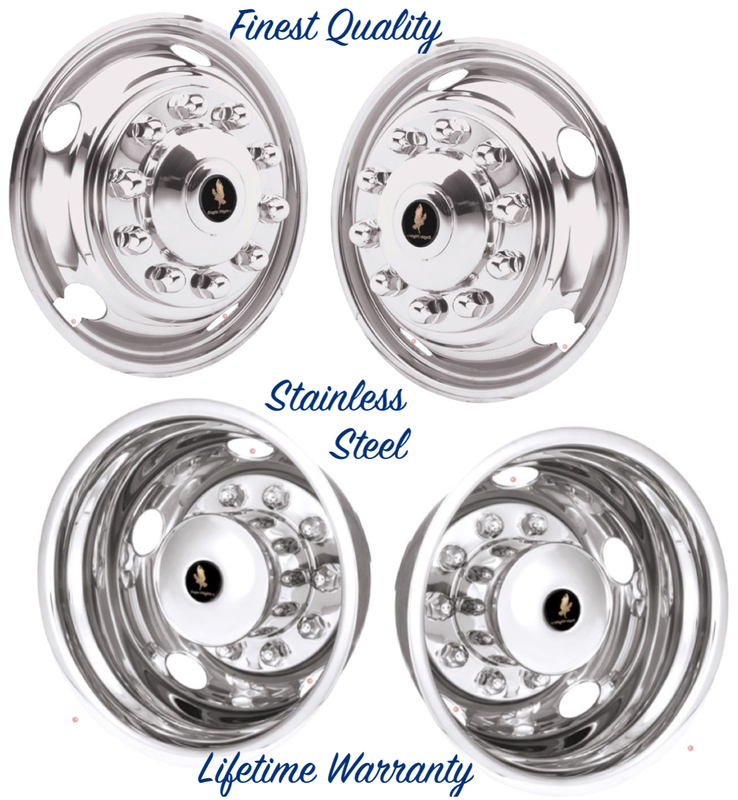 Designed for Ford E350 and E450s equipped with Accuride Wheel numbers; 28618, 29317, 29398, 29943 or 29579. Please verify your wheel number, lug nut count, and wheel hand hole count before ordering. The wheel number can be located between the lug nuts or about an inch in from the outer edge of the rim. Verifying this number is the best way to ensure fit, as just ordering by make, model or year has often been proven to be unreliable. We do not sell knock-off generic, unbranded wheel covers that are designed to fit a broad range of specifications. Squeaks and rattles can be a result of a poor fit of wheel covers over steel wheels. In contrast, our line of covers has been designed to match the specifications of OEM wheel numbers. This significant attention to details has enabled us to set the standard for precise fitment, thereby ensuring long-term, trouble-free performance. Verifying that your wheel number, lug nut count, and wheel hand hole count matches our product description will ensure that your new wheel covers will fit perfectly. Please do not rely just on vehicle make, model, and year or memory (if the truck or trailer is currently not available), as this can result in mistakenly ordering the wrong set of wheel covers. We do not want this to happen to you, so please take the time to physically check your wheels to ensure they match the given description before ordering. For steel wheels only - NOT FOR ALUMINUM WHEELS. Manufactured from our Finest Grade, NEVER RUST Bright Polished Stainless Steel, and backed by our lifetime warranty. We do not use anything but the best quality stainless to avoid the cracking and yellow tint discoloration that is common to lower quality generic unbranded knock-off covers. Our products will NEVER RUST in any climate and rival chrome in appearance. In the event of damage or an accident, we also make available single covers or hardware to our customers, so you can fix what is required, rather than buying a whole new set. Each set or individual cover we offer includes our trademark high-quality resin bubble center emblems (as shown) that dress up the appearance when installed and are your assurance you have purchased Genuine Eagle Flight covers. Eagle Flight covers meet the highest ISO quality standards. Meeting such stringent world-renowned manufacturing standards is rare in our industry and assures the highest level of fit and finish. Every one of our Eagle Flight covers will look the same as the day of installation when the vehicle is retired from service and will NEVER RUST or turn yellow over time. 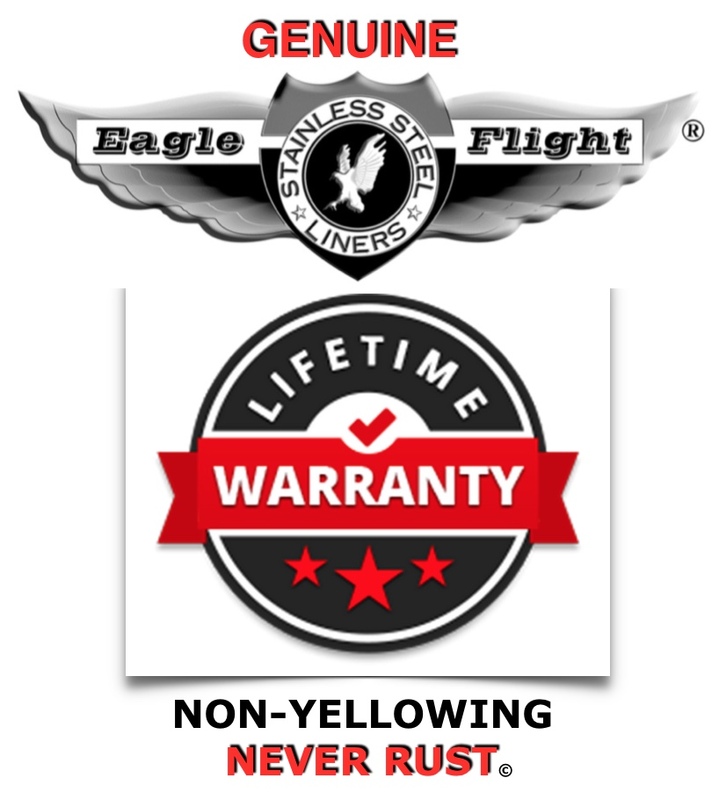 Unlike low quality, unbranded stainless wheel covers, which often will rust and typically do not have a warranty (or a very minimal one at best), our Eagle Flight covers have a Lifetime Finish Warranty which serves as your assurance you have purchased the highest quality available.